Going green isn't intimidating at all. Simple things in your everyday like using both sides of the paper can make a huge difference. It may take a few reminders for it to take root but lets all work towards a cleaner, brighter future! 1) Go paperless > E tickets for movies, plane tickets, credit card statements etc! 2) Shut down your computer after usage. It may go to sleep/hibernate mode but it is still using up energy! Rethink when you buy bottled water! 6) Donate it away! Before you throw something away, think about it! Someone else might need it! 10) Support green businesses like Blackmores! they are a company that cares for the environment and the community. Therefore in everything they do, they seek ways to respect nature and give back to the community. and choose a simple green pledge! They are now at 4435 pledges, help them acheive 5000 & they will unlock Eco treats! Their Eco Krill Vanilla 1000mg will go on 50% off for a week!! MORE TREES FOR SINGAPORE JUST BY A FEW CLICKS? and you can make a few pledges at any one time. 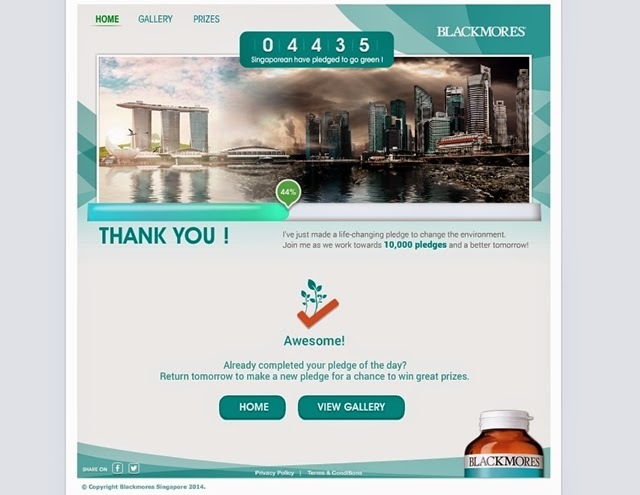 Watch how the Singapore city skyline turn cleaner with every pledge made! If you follow me on Dayre, you might know that I've started taking health supplements this year and compared to 2013, I noticed that my immune system is stronger and I don't fall sick as often! And did you know that Blackmores supports Marine Stewardship Council (MSC) as part of its commitment to achieving the highest possible standard of sustainability sourcing for its fish and krill oils? Each Go Green pack is at an exclusive promotion of 70% OFF second item. Plus, it comes with a $5 gift voucher and a Blackmores recycle bag! Selected Go Green Packs, Glucosamine 1500, Buffered C, Evening Primrose Oil and Omega Daily are available at Watsons, Guardian and Unity. Noticed that Blackmores's packaging are made of recycled products? Support green businesses for a brighter and cleaner future!